Opening the collection is an alternate history wherein the UK made peace rather than carry on WWII with the Nazis. “Weihnachtsabend” tells of the ‘glitter and glamour’ of Europe after the Nazi’s triumph. A vividly etched story, the imagery has sharp edges even as the storyline dissolves into pure, purposeful bizarreness made all the more surreal by being Christmas Eve. The story bookending the other side of the collection likewise containing strongly surreal material, “I Lose Medea” tells of a man and his girlfriend who, attempting to go camping near a beach one day, encounter an army of old. Cannons set up and fired, the story shifts in and out of transparency, all as tragedy looms for the man and his girlfriend. A story from the Pavane setting, “The White Boat” is the tale of a quiet young fisher girl whose bravery comes spilling out when the innocence of her village is pushed to the limit. A subtle, beautiful story that, like most of Roberts’ fiction, is as evocative as it is meaningful, it can be read several times and only gain potency. Rebellion doesn’t have to be in the form of a raised fist or Molotov cocktail. Feeling quite Ballardian, “The Passing of the Dragons” features two behaviorists on a remote planet studying the local fauna. The dragons a large, insect-like species, they are the only remaining life after human mining operations have killed off the other living creatures. When one of the silent but massive dragons chooses a spot in front of the research station as its place to pass away, the two behaviorists have varying reactions. I would perhaps be remiss to note this tale indirectly hints at Roberts’ Buddhist leanings, particularly the cycle of life of the dragons as opposed to the behaviorists’ approach. The story’s title the name of a crashed spaceship, “The Trustie Tree” tells of the one human survivor and his brief but profound encounter with the indigenous Kalti people he meets emerging from the wreckage. Featuring Roberts’ prodigenous skills at describing landscape and setting, the story is largely a travelogue, but one wonderfully colored by the delirium induced by injuries sustained in the crash. A companion piece, “The Lake of Tuonela” tells of further human involvement on the Kalti planet years after “The Trustie Tree”. An indigenous Kalti again acting as a guide, the circumstances this time around, however, are somewhat reversed as a small group of humans ask him to help explore a local natural phenomenon. Not precisely a voice in support of human commercial interests, the story speaks in symbolic terms about post-colonial concerns (largely before post-colonialism was a thing). Reading the back cover of The Grain Kings, one might believe the entire collection is about the the title story. 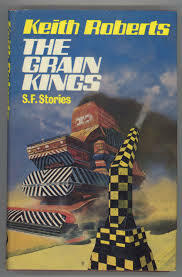 Only one of seven stories in fact, the novella “The Grain Kings” is the most commercial piece in the collection (hence the cover spotlight, I assume). Massive combine harvesters trundle across the plains of lower Alaska, gathering grain and helping power the world’s big economies. Populated by dozens of people, from technicians to repairmen, baristas to the captain, the mobile factories contain their own bubble cultures, a facet the British reporter O’Hara is sent to do a piece on for his newspaper. Drinks in the combine’s bar and a brief love affair are not enough, however, to distract him from the political games being played on the wide fields by Russian combines roaming ever so dangerously close to the American combine he rides. Compared to the other pieces in the collection, “The Grain Kings” is a rather straight-forward, entertaining piece. Lightly addressing Cold War concerns, the reader may not remember the plot line later, but the giant combines come to life. In the end, The Grain Kings is a dense, substantive collection of long-ish short stories that feels more than the sum of its pages. While I think “The White Boat”, “Weinachtsabend”, and “The Trustie Tree” the best of the collection, readers with more of a mainstream, familiar bend to their reading will likely prefer the title novella or “The Passing of Dragons”. All in all, however, the scenes are artfully and accurately set, even as Roberts deftly handles the-between-the-words mood and theme. I read this collection years ago and think it is his best. I've recently reread a couple of the stories in their original publications (Impulse, New Writings in SF) and look forward to catching up with the others soon, especially Weihnachtabend.